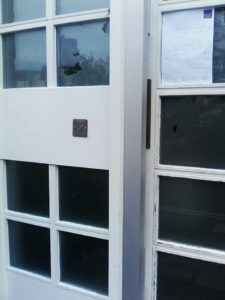 Recent job replacing a maglock at a front door stairway in Marchmont, Edinburgh. A ‘maglock’ or electromagnetic lock is a locking system that consists of an electromagnetic device and armature plate. They are most often used in the front doors of tenement stairways to automatically, open the lock when an intercom button has been pressed. They are also typically found on emergency exit doors due to their simple construction. There are two types of magnetic locking devices. Fail safe or fail secure; a fail-safe system is de-energised when power is lost and remains in the open position whereas a fail-secure system remains locked when all power is lost. 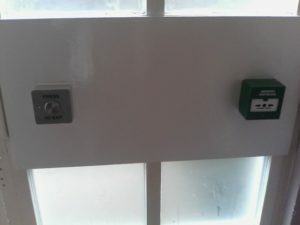 The lock system normally has a timer that can be set to keep the lock open; this is either 15 or 30 seconds. 2. Fast operation. When the button is pressed, the lock is opened instantly. 3. Well constructed. These systems can take more abuse than other types of locking systems. 1. Require constant power to work properly and be secure. 2. Power cuts can cause them to de-energise and fail. 3. More expensive than other systems. We have extensive knowledge and experience of maintaining and replacing all kinds of magnetic locks. 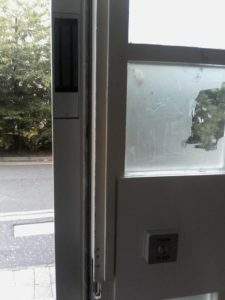 Call Smartlox for a no obligation quote and advice on magnetic lock installations.